This Workshop will be devoted to the multi-facetted topic of contested historical landscapes. 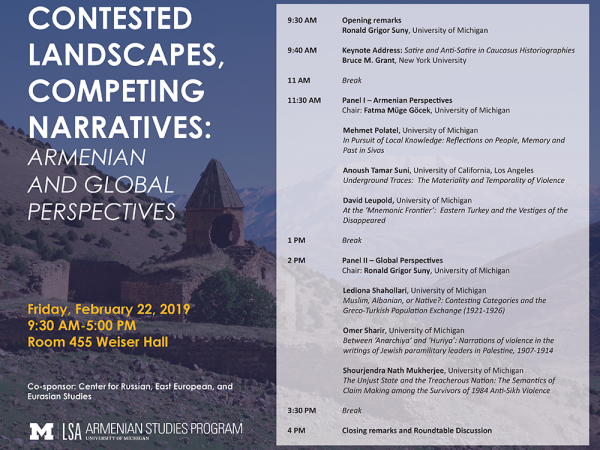 Bridging Armenian and global perspectives—encompassing a vast geography from Southeastern Europe to the Middle East and the post-Soviet space—the workshop participants will explore competing narratives on cultural heritage, history and, ultimately, homeland. Drawing from the mutually-enriching expertise of different academic disciplines—from history and political science to sociology and anthropology—this workshop will excavate from the debris of 20th century landscapes silenced narratives on disappeared populations, alien homelands and collective violence. The Center for Russian, East European, and Eurasian Studies organizes a number of public events each year such as lectures, conferences, and films, many in collaboration with other U-M units. Please use our searchable events calendar for information about upcoming programs sponsored by CREES. To see all events organized by CREES and other affiliates of the Weiser Center for Europe and Eurasia this semester, click the image to the right for a PDF calendar.